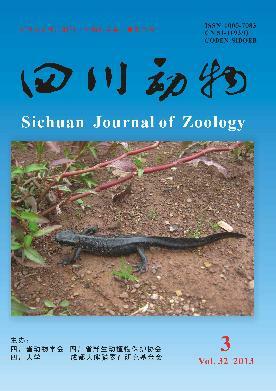 英文摘要：In order to provide age identification method for Anourosorex squamipes, we analyzed the weight of 134 individuals (86 females and 48 males) which were captured in Dafang county, Guizhou province from 1996 to 2012. The results showed that the average weight of A. squamipes was 31.12 g± 6.48 g. According to the frequency distribution of weight and the reproductive condition, A. squamipes was divided into five age groups. We established the weight division criteria for each age group: youth group (Ⅰ) is less than 23.0 g, sub-adult group (Ⅱ) was 23.1 ~ 28.0 g, adult group Ⅰ (Ⅲ) was 28.1 ~ 33.0 g, adult group Ⅱ (Ⅳ) was 33.1 ~ 38.0 g and old group (Ⅴ) was more than 38.0 g. Significant positive correlations were observed between body weight, carcass weight and body length. On the basis of regression equation between body weight and carcass weight, we established the carcass weight division criteria for each age group: youth group (Ⅰ) was less than 15.0 g, sub-adult group (Ⅱ) was 15.1 ~ 19.0 g, adult group Ⅰ (Ⅲ) was 19.1 ~ 23.0 g, adult group Ⅱ (Ⅳ) was 23.1 ~ 27.0 g and old group (Ⅴ) was more than 27.0 g. There was significant difference in body weight and carcass weight among age groups. Body weight and carcass weight increased continuously with the growth of population age. Furthermore, there was significant difference in population reproduction across different age groups. With the growth of population age, population reproduction increased continuously. Adult group I, adult group II and old group were the main reproductive contributors. The study showed that the average pregnancy rate, average testicular descent rate and average reproduction index of these age groups were 37.10%, 72.00% and 1.39, respectively. Moreover, there was significant seasonal variation in the population age structure.